This article focuses on the upcoming six game NHL main slate, highlights a few DFS players that stand out, and a few potential wagers against the spread. Feel free to jump in our new sports betting Slack channel for additional information and updates when it comes to tonight’s action. Make sure to stay tuned for additional announcements as we continue to add articles, videos and additional tools centered around our sports betting content. Make sure to follow our @AwesemoOdds twitter account for the latest. Elias Pettersson – Vancouver – $6900 DK – There are some solid games to attack and this is one of them. Vancouver rolls in as a -115 favorite tonight against Carolina. Pettersson tallied seven goals in the last nine games and ten points overall. He averages 2.1 shots on goal a game currently and is dangerous with Brock Boeser on his wing. Overall on the season, Pettersson has 13 power play points in 39 games which is good production. Carolina’s penalty kill is just above 78% on the road which ranks in the bottom third. The center is a big reason why Vancouver is 12-9-3 at home. It is why some may even want to risk a tiny portion of their bankroll and place it on Vancouver. Also, keep an eye on the over/under. Does it stay at 5 1/2? It appears like it should. It may be worth it to take a look on the over. 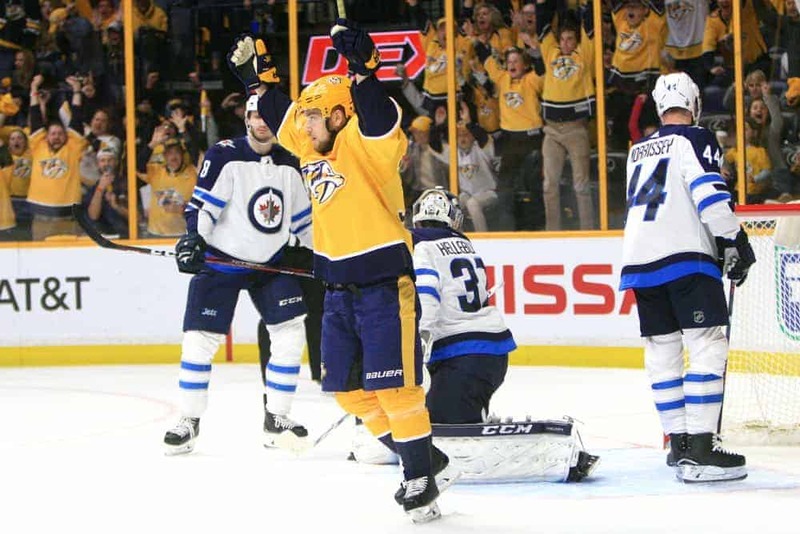 Viktor Arvidsson – Nashville – $7100 DK – Arvidsson has been a shots machine with 40 in his last ten contests on 71 attempted. The left winger scored eight times in that span yet just one special teams point. The price is a solid play given Nashville is 13-9-4 on the road while scoring 3.19 goals a game away from home. Arvidsson should fire 4+ shots tonight and have a few chances on the man advantage as well. The chances Nashville’s top line finds the back of the net is high. Vancouver (-115) vs Carolina, Over 5.5 – Breaking down this game indicates a possible buy at -110 for the game over. Projections indicate an Alex Nedeljkovic versus Jacob Markstrom matchup. The Carolina goalie has been in the AHL and now gets another shot at the NHL. The 23 year old mopped up two years ago in his only NHL appearance. However, Vancouver’s Markstrom has been better while yielding two goals or less in seven of his last ten outings. This is good value for a young Vancouver team trying to stay in the playoff hunt. Carolina has scored 18 goals in the last five games while Vancouver has tallied 17. The over comes in play as it should stay at 5.5. Take a look at Vancouver -115 to score first. Carolina could give up a quick goal early with ease here. Vancouver plays aggressive with the Pettersson line especially. The first period over looks like a good bet in the Minnesota-Colorado contest. Finally, do not be surprised if St. Louis scores first in Anaheim.